The Mpumalanga Lowveld is home to the Kruger National Park, the largest game reserve in South Africa - a wildlife sanctuary like no other, and considered the crown jewel of the country's national parks. Covering nearly 2 million hectares of land, the Kruger National Park stretches for 352 kilometres from north to south along the Mozambique border, and lies across the provinces of Mpumalanga and Limpopo in the north of South Africa, just south of Zimbabwe and west of Mozambique. Most of the Kruger National Park, is situated in the Lowveld, the land of baobabs, fever trees, knob thorns, marula and mopane trees, and it's in this open woodland interspersed with long grass in which you'll find the Big Five - lion, elephant, buffalo, leopard and rhino, the birding Big Six, and more species of mammals than any other African game reserve. In the truly wild northern part of the Kruger National Park there are less animals than in the southern parts of the Kruger Park, but in the north you'll be rewarded by the sight of the magnificent baobab trees that dominate the landscape. You can do a Kruger Park self-drive safari or a guided safari tour, which will take you to picnic sites, waterholes and hides. Other exciting options include Kruger Park walking safaris, Kruger Park mountain bike trails and Kruger Park 4x4 trails. The capital of the Kruger National Park is Skukuza, the Kruger National Park's largest rest camp and administrative headquarters. 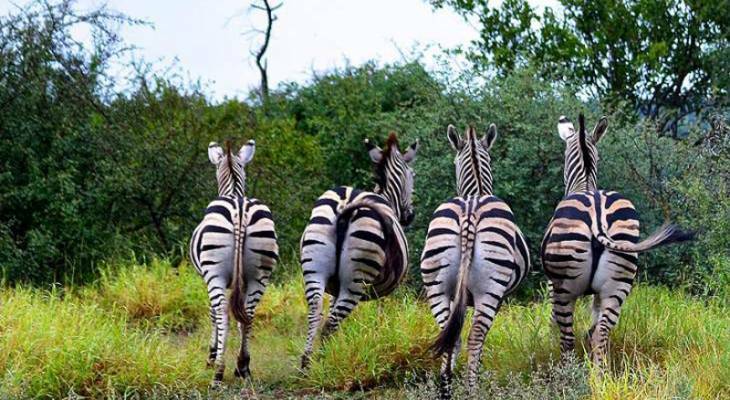 Skukuza is situated on the southern banks of the Sabie River, and boosts some of the finest bush lodge and tented accommodation in the Kruger National Park . Kruger National Park, Sabi Sands - privately owned safari game reserve lying adjacent to the Kruger National Park. Kruger National Park, Komatipoort - lies just 8kms from the Crocodile Bridge gate into the Kruger National Park. Kruger National Park. Hazyview - 16km from Kruger Park Numbi Gate, and 12km from Kruger Park Phabeni Gate. Kruger Park, Marloth Park - enter the Kruger Park via Crocodile Bridge Gate 14kms or Malelane Gate 35kms. Note: If you choose accommodation in the Kruger Park, it should be remembered that this is a malaria region - please consult your doctor or travel clinic for advice on how best to protect your family. Kruger Park overview. Kruger Park Accommodation and Information.